Mars is one of our nearest space neighbors, but even it is still pretty far away—which is why its closest approach in a decade is such an unmissable opportunity. Here’s how and why to watch Mars’ close approach, and what you should be looking for when you do. Mars’ close approach occurs (just like it sounds) when Mars’ and Earth’s orbits bring the two planets unusually close. 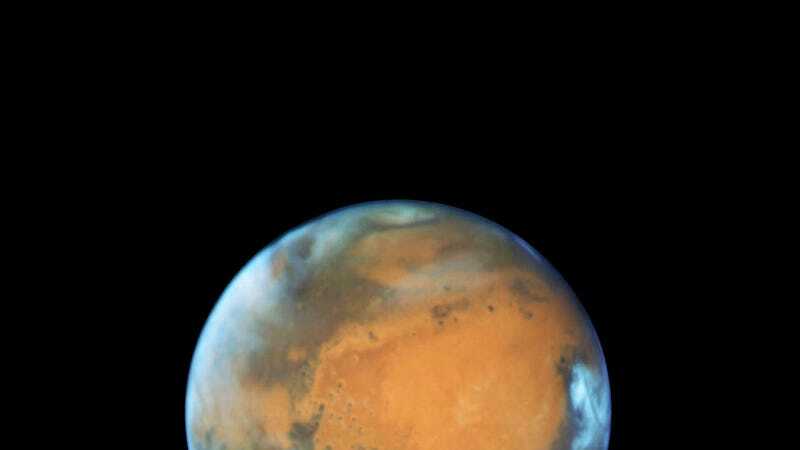 At their closest approach which occurs on May 30th, Mars and Earth will be within 46.8 million miles of each other. The last time the planetary neighbors were that close was in November 2005. Mars’ closest approach in over a decade isn’t just an obscure astronomy fact with which to impress your friends and dazzle your foes, though. It’s also an excellent time to catch views of the planet you wouldn’t see otherwise. Its close distance makes the Red Planet appear slightly brighter and larger in the sky than usual. The difference is enough to make the planet easier to spot even with just the eyes. If you choose to use a telescope or a good pair of binoculars (my personal choice), then you’ll be treated to an even more powerful view than usual. Occasionally, rumors drift around the internet about Mars suddenly expanding, balloon-like into our sky, like a big red moon. Let’s be very clear: That is not happening. That has not ever happened. That will never happen. And yet, even if Mars isn’t going to look anywhere near as big as the Moon (ever), it will look slightly bigger and brighter in the sky, compared to its usual size. Just how much so depends on when you catch it. Mars isn’t going to look anywhere near as big as the Moon (ever). 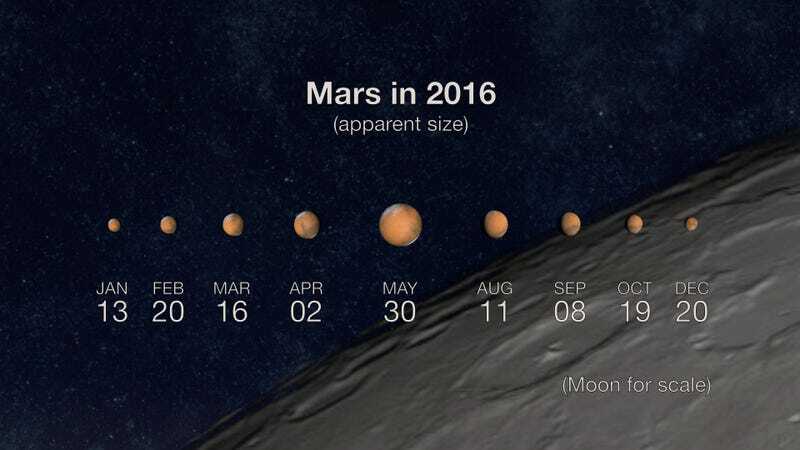 As you can see, Mars has been moving slowly closer to us in the past few months, and will fade away into the distance in the months after. The peak of Mars’ close approach will hit on May 30th. Although May 30th is the peak, really any days between May 18 and June 3 are going to be excellent for up-close viewings of the red planet. The exact moment of the close approach is 5:34 p.m. EDT. For obvious reasons, however, this is not an ideal time for night sky observation. My recommendation for the best time to observe Mars’ close approach is midnight on May 30th. This is when the planet will not only be almost at its very closest and brightest, it will also be dark and Mars will be at its highest point in the sky. To find the planet at midnight, look south and locate the bright star Antares in the constellation Scorpius. Mars will be just over the constellation’s head, to the right of Antares. If you choose to search out Mars either before or after midnight, you’re going to want to adjust your search field just slightly from the south. Before midnight, look southeast and after midnight, look southwest. Of course, in case of cloudy conditions, you can watch along with the folks over at Slooh as Mars leans in a little closer towards us. Slooh will be hosting a live feed from their observatory telescope starting at 9 p.m. EDT on May 30th. But really, this whole holiday weekend is going to be wonderful for viewing, so (even if you don’t hit the May 30 peak) try and make at least a few of your own observations outside. You’ll be glad you did. This article was originally published May 27, 2016. It has been updated for May 29, 2016.